As part of his desire to give hope to the poor and needy of his community Pastor Ivan Lugolobi established the Revival Centre in the small town of Matugga 12 miles north of the Ugandan capital Kampala. 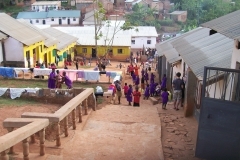 The Centre has grown from a primary school of 30 pupils in 2001 to a primary school of 450 pupils, a secondary school of 350 pupils, an orphanage for 150 children, a clinic serving the Centre and the community and a busy church. In July 2009 a farm was established. Despite their limited facilities and resources the primary and secondary schools strive to provide an education to local children and boarders from further afield, and to 120 resident orphans and needy children who have been referred to Pastor Ivan from many parts of Uganda. In Uganda education provides the main hope of escaping poverty and living an independent life. Although living conditions at the orphanage are quite poor, the children are being cared for in a loving environment where they feel valued and special. 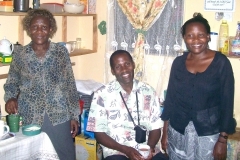 Pastor Ivan’s elder sister Ruth runs the clinic which is open 24 hours a day and treats up to 450 people a month. In addition to treating fee paying patients, the clinic treats the poor who would be turned away from other medical centres. The church brings people from all tribes and backgrounds together and is at the heart of community life. Associated with the church is a ladies group that runs projects to help widows and the mothers of poor families start up small businesses to make a living. Ivan’s twin sister Jane is heavily involved in this work. As supporters it is our privilege to work alongside Ivan, Ruth and Jane in order to help them meet the needs of some of the poorest people in Uganda. You can find out more about how the Revival Centre got started and the ministries established at The Revival Centre by following the links below or using the menu bar above.